Periodontal scaling is a procedure involving instrumentation of the crown and root surfaces of the teeth to remove plaque, calculus, and stains from these surfaces. Calculus is calcified bacterial buildup. This buildup can be utilized by different bacteria to form complex and destructive bacterial ecosystems that cause damage to gums, destroy bone, and may provide entryway into the bloodstream, where damage can spread to other parts of the body. Therefore, scaling and root planing is performed on patients with periodontal disease and is therapeutic, not prophylactic, in nature. Periodontal scaling may precede root planing, which is a definitive, meticulous treatment procedure designed to remove cementum and/or dentin that is rough, may be permeated by calculus, or contaminated with toxins or microorganisms. When done in a thorough fashion, some unavoidable soft tissue removal occurs. This procedure is used as a definitive treatment in some stages of periodontal disease and is part of pre-surgical therapy in others. It is recognized that debriding the root surface is a critical element in reducing inflammation and can significantly diminish halitosis (bad breath). Periodontal scaling and root planing are arduous and time consuming; this therapy usually requires two to four visits. They may need to be repeated and may require local anesthetic. In some areas of moderate bone breakdown and in cases of abscess formation an antibiotic may be placed right at the site in question. This increases the concentration of the antibiotic, delivering a greater punch. If a patient has a single moderate deep pocket this therapy has shown to be effective in “repairing” the site. Repairing a site is different from regeneration and remodeling. It is less stable and without perfect follow up can lead to a return of the deep pocket. This is why it is reserved for isolated lesions with mild to moderate damage and is often used as an adjunctive treatment to surgery. It is not an alternative to surgical therapy. In cases of an acute infection leading to abscess formation the locally delivered antibiotic may be followed by a prescription of systemic antibiotics. 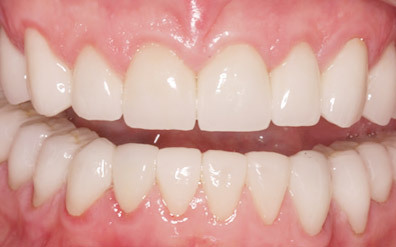 Occlusal splinting is bonding together of anterior teeth to provide cross arch stabilization. 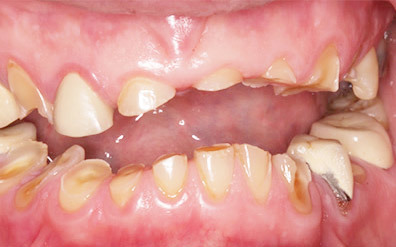 This treatment is used as a temporary treatment to retain poor to hopeless teeth as long as possible. This may be needed in order to address other dental needs prior to starting more definitive treatment such as extractions and implant placement. This treatment is sometimes utilized in order to ‘buy some time’ until the patient is ready to proceed with the permanent treatment plan.